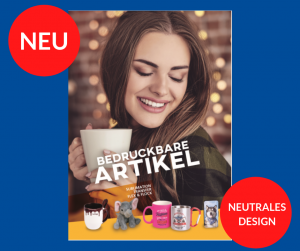 Hot of the press, the new catalogue Schulze bedruckbare Artikel 2019 (printable articles) is now available. This neutral catalogue contains all printable treasures for sublimation-, transfer-, flex- and flock printing. You can download it from the website or order by e-mail a print version. Nearly 100 pages full of product ideas show the possibilities for a customized and unique promotional gift for almost every opportunity. The catalogue includes important product information and the readers can see all the facts at a glance. The design of the catalogue is neutral, so it can be used for your own customer.